Hotel Muiden - Are you looking for a nice and original overnight stay in this historic port city? Book a bed and breakfast on one of our hotel ships in the harbor. This is an original and fun way of staying overnight during a weekend trip or city trip. Throughout the year you can book overnight stays on a ship and in the winter the fleet of hotel ships is supplemented by ships that sail summers and in the winter moor in the city. After a day of enjoying this nice harbor city it is a great home on one of the Sleep ships in the harbor. If you are two, you are ahead less than 40 euros do you already have a bed! It is an economical way of staying overnight during a city break or weekend away. You sleep on a ship with an atmospheric salon as a central center. A comfortable and made-up bed awaits you in your cabin. And there is one in the morning delicious breakfast is ready for everybody in the salon. During nice weather, you can enjoy a cup of coffee on the deck while looking out over the water. And you have plenty of time, because check-out is only after 12:00. Our sailing charter ships come in various shapes and sizes. From atmospheric sporting ships to beautiful luxury accommodations. In addition to bed and breakfast, the vessels are also very suitable as group accommodation for groups of friends, family and colleagues for, for example, family celebrations and company presentations or outings. Is your ideal accommodation not listed? Sometimes you can not find the ideal ship. Then we can have vessels from other places entered so that the overnight capacity is increased. If you have specific wishes or other questions? Then you can always contact us without obligation. Do you want a hotel stay in another city? No problem because there are many more Sleepers spread across the Netherlands and abroad. Already in 777 stood on this spot a church and were fishing grounds around possession of the Utrecht church of Saint Martin. In 1122 Muiden got together with Utrecht city charter of Emperor Henry V. Since January 1 2016 is Muiden Naarden Bussum and merged into the new municipality Gooise Lakes. This rustic and welcoming town has attracted in the course of history, kings, lords, poets and writers. It is a city with a rich history and taste it as you wander through the streets. The best place to experience the history is of course in the Muiderslot. But Muiden has more to offer, there are cozy shops and the port and the lock is always activity of the vessels. The impetus for this castle was given by the Dutch count Floris V. He left around 1285 build a stone fortress in a strategic position at the mouth of the river Vecht, the main route to the diocese Utrecht.Tijdens a falconry Floris V was 1296 kidnapped by his own nobles and brutally murdered and destroyed his castle. 1370 from the original Muiderslot was restored and enhanced with the residential wing on the side of the Zuiderzee. In 1576 the castle was fortified with earthen ramparts and bastions. Since then the castle has had many famous residents. There followed a moment of decay but the Muiderslot the demolition was rescued in 1825 and 1878 when the National Museum was inaugurated. After three major restorations breathe furnished rooms of the castle and gardens again the atmosphere of the Dutch Golden Age. 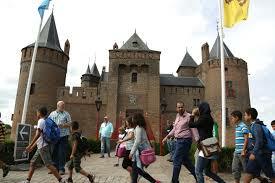 The building and presentation of medieval special collection of weapons show the importance of the Muiderslot as knights castle of Count Floris V. Nowadays, to visit the castle and there are many activities throughout the year. Visiting Muiden is not complete if you have not visited this particular castle. Muiderslot Everything about opening times and special themes in the castle.